Half-price replacements with the purchase of anything else of equal or greater value. 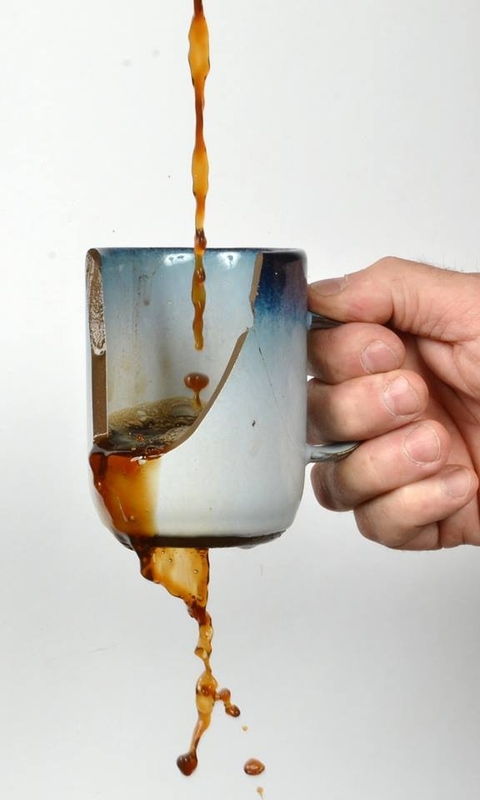 Did you (or--ahem--someone else) shatter your favorite mug? Has that chip on the edge of your best serving bowl become too unsightly to look at anymore? Well, good news! The first Saturday of each month is Butterfingers Day at our showroom. On that day, you may bring in up to six broken pieces for half-priced replacements with any additional purchase of equal or greater value. For our out-of-state customers, we offer the same half-price replacement policy, and you may mail back the broken piece anytime. If living abroad, you can take advantage of this policy, but due to shipping costs, the return may not be cost effective. Please print, fill out, and include this return form with your broken pieces. We regretfully cannot offer half-priced replacements for discontinued designs, nor can we guarantee that your new replacement pieces will perfectly match a vintage set. Email us at peterpotspottery@verizon.net if you have any questions. Every piece we make is perfectly safe in the dishwasher. Use quality or natural dish detergents and a rinse aide to prevent residue build up and hard water spots, which will have a dulling effect on the pottery. As with any ceramic, avoid thermal shock when using our pottery in the microwave or oven by never going directly from cold to hot (e.g. from fridge to hot oven) or vise-versa, and allowing most of the surface of the pottery to heat evenly. We recommend against heating food on our plates or platters, since their large surface area can be difficult to heat evenly. The hot spot of food on an otherwise cold plate can cause it to crack. All of our casseroles dishes, pie plates, and bean pots are guaranteed ovenproof in conventional ovens. The underside of most of our pottery is unglazed, and so we recommend using plate seperators or paper towels when stacking pieces to avoid scuffing the surface and edges. Over time, the underside of our pottery will become smooth, but you can always speed up this process with fine grit sandpaper. You can exchange or return any pottery in showroom-condition within 30 days after purchasing. A receipt is required for refunds; if no receipt is present at the time of returning, then a store-credit for the current value of the item(s) will be issued instead. Online orders may be cancelled for a full refund at any time prior to their shipment. If you are not satisfied with what you have received, you may return the item(s) for refund or exchange within 30 days of receipt, but you are responsible for additional shipping costs. Items must be received by us in like-new condition. Refunds are issued once we have received your returned item(s). If you plan on returning or exchanging an online order, please call during business hours or email us at least three days before dropping off the items in the mail. Please feel free to re-use the original packaging for shipping. Make sure that there is no shifting inside the package once sealed, and that there is adequate space/cushioning in between pottery pieces and the walls of the box. Please also check that all old shipping labels are crossed out or covered. Shipping rates are based on the package size, weight, and destination, and all orders are insured for their full value. Most orders are sent within 48 hours, with the exception of orders for which we must make pottery. Please allow for up to two weeks for our potters to complete your piece(s). CONTINENTAL US: UPS Ground Shipping only. ALASKA, HAWAII: Shipments to Alaska, Hawaii, and Puerto Rico are best sent by US Postal Service. Place your order and we'll find the most cost effective way to ship it. We'll confirm the price and method with you before shipping or charging. FYI: Priority Mail International prices for a 10 lb package to Canada $31, Europe $52, Japan $60 (6-10 days). We try to pack everything very well, but occasionally pottery can break during shipping. If something has arrived broken, please get in touch with us right away. We will send you a replacement for any broken piece as soon as we can, at no additional cost to you. Currently, the most simple way to register with us is to add our pottery to a universal registry website, such as My Registry. We are always here to help, so feel free to reach out to us about your registry or with any questions you might have along the way! All information we collect from you is stored securely, and is used solely to fulfill your order, for customer service purposes, or occasionally, to communicate new products or sales, from which you can opt-out of at any time. We do not sell or rent your information to anyone else, and only ever share this information with secure third party service providers that provide business or support functions on our behalf. “Cookies”, which are small data files served by our Site and stored on your device or computer and often include an anonymous unique identifier. For more information about cookies, and how to disable cookies, visit http://www.allaboutcookies.org. Google Analytics, which tracks and reports traffic and actions occurring on the Site. You can read more about how Google uses your Personal Information here: https://www.google.com/intl/en/policies/privacy/. You can also opt-out of Google Analytics here: https://tools.google.com/dlpage/gaoptout. “Log files”, which track actions occurring on the Site, and collect data including your IP address, browser type, operating system, referrer, and date/time stamps. “Web beacons”, “tags”, and “pixels”, which are electronic files used to record information about how you browse the Site. Information provided to us by you when registering as a customer or through the use of forms on our Site (e.g. when placing an order through our website, when contacting us for product information, or when signing up for our email list), or when you send us an email. We use the information collected on our Site primarily for two purposes: the first is for fulfilling orders placed through the Site, and the second is for optimizing and improving how our Site functions and how users experience it. Screen our orders for potential risk or fraud (in particular, IP addresses). To provide you with information or advertising relating to our products or services, including email campaigns, which can be opted-out of from anytime by clicking “unsubscribe” in any campaign email sent by us, or by contacting us directly by email or phone. You can find our contact information below. All of the Personal Information collected by us is for our use only as stated above. We only share your Personal Information with third party service providers that provide business and support functions on our behalf. For example, payment processors and postal and delivery services may receive relevant Personal Information from us in order to fulfill an order you placed on our Site. We may also share your relevant Personal Information with third parties that administer promotional campaigns on our behalf, such as MailChimp. For information on how these third parties use your Personal Information, please refer to their privacy policies. We do not sell or rent any of your Personal Information. Our Site is not intended to be used by anyone under the age of 13. We do not knowingly collect Personal Information from children under 13. If we discover that a child under 13 has provided us with Personal Information, we immediately delete this from our servers. If you are a parent or guardian and you are aware that your child has provided us with Personal Information, please contact us so that we will be able to do necessary actions. Wherever we collect sensitive information (such as credit card data), that information is encrypted and transmitted to us in a secure way. The Site as a whole is secured through Secure Sockets Layer, or SSL, a technology that secures the connection between your browser and the website you’re visiting. To verify that SSL is protecting a page, look for a URL beginning with https://, instead of http://, and a green, closed padlock icon. While we use encryption to protect sensitive information transmitted online, we also protect your information offline. Only employees who need the information to perform a specific job (for example, billing or customer service) are granted access to personally identifiable information. The computers/servers in which we store personally identifiable information are kept in a secure environment, as are any hard copies we may have of your Personal Information.